Yesterday was Excursion Day; Escape From Routine Day, Change of Scene Day, New Input Day. Target destination: the Ashmolean Museum in Oxford to see an exhibition of Japanese prints, wander the antiquity-filled halls and partake of coffee and cake in the café (very good cake it was too). 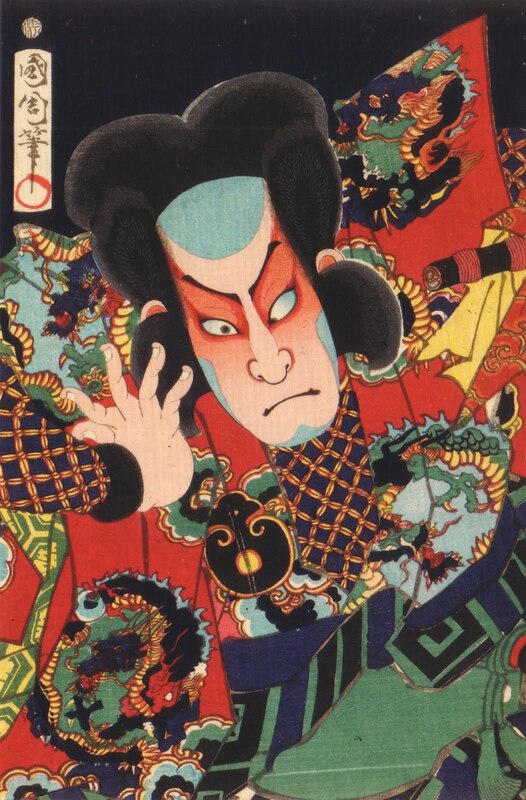 The exhibition, Yakusha-e: Kabuki prints, a continuing tradition, shows images of Kabuki actors over the centuries . 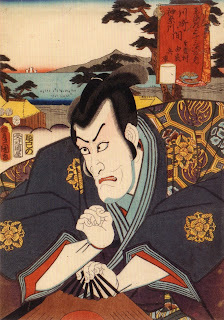 The prints were made by three Japanese artists – Utagawa Kunisada (1786-1864), Toyohara Kunichika (1835-1900) and Tsuruya Kokei (born 1946). 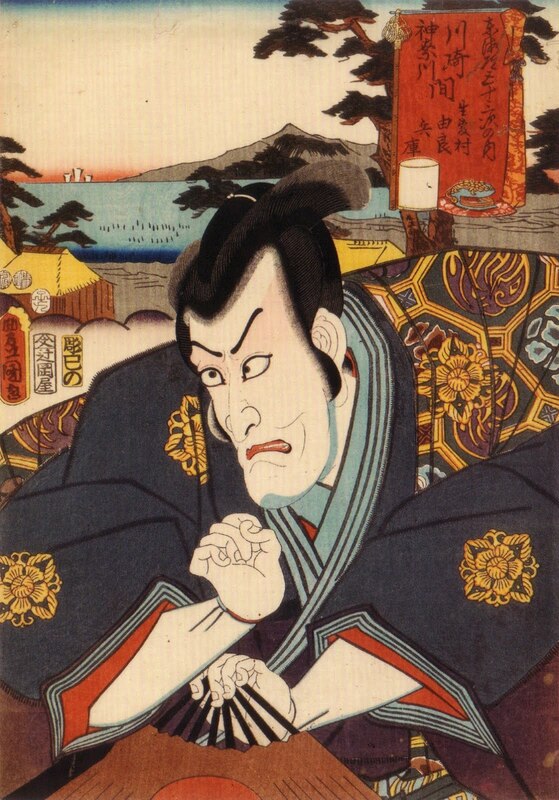 Kabuki theatre began in the early 1600s. The actors became celebrities, much like film stars today, and attracted a huge fan base. There was a high demand for images of the actors which kept the artists busy providing drawings to be made into prints. 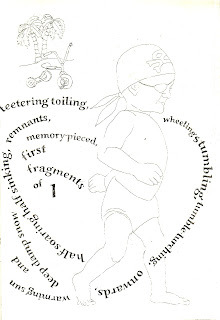 The drawings would be passed on to engravers who would carve the blocks. These in turn would be handed over to printers for printing. These prints (and those with other subject matter such as landscape and historical images) were known as Ukiyo-e; pictures of the floating world. 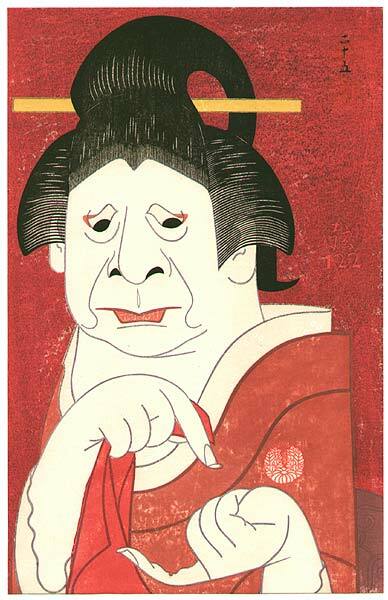 A subset of Ukiyo-e, Yakusha-e depict actors striking dramatic poses - ‘mie’. 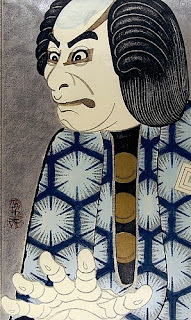 Traditionally these were full-length figures with minimal backgrounds but from the 1790s, artists began to vary the designs to half-length portraits and dramatically cropped views of head and shoulders – Okubi-e. This had the effect of bringing ardent fans closer to their favourite stars (or at least, giving them that feeling), and facial features and expressions could be emphasised. Bright red makeup was used to heighten emotion – I particularly like the images where the subject is cross-eyed; this indicated a moment of emotional climax. They look rather comical but presumably it was all deadly serious. Motifs on the costumes often depicted the content of the play. I like ukyio-e; but to my untrained eye, they've always looked a bit samey to me. However, seeing the work of Kunisada and Kunichika side by side, the differences in style are quite evident. Kokei’s work is different again and has a more modern, graphic feel to it, and in fact, he carries out all stages of the process himself from drawing to printing - unlike the customary methods followed by Kunisada and Kunichika. He shows though that this 400 year old tradition is still very much continuing. An interesting exhibition should you be in the vicinity before 4 March. 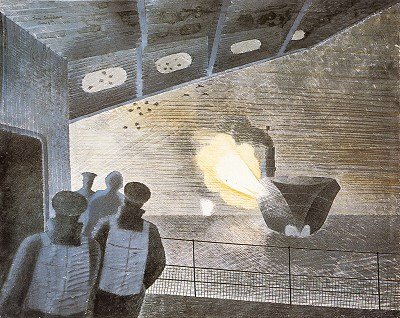 I went to a talk about the life and work of Eric Ravilious this week. I’m familiar with his wood engravings but knew little of his life or his paintings so thought I’d take an early lunch break and trot along to the FOSMAG lecture in town. 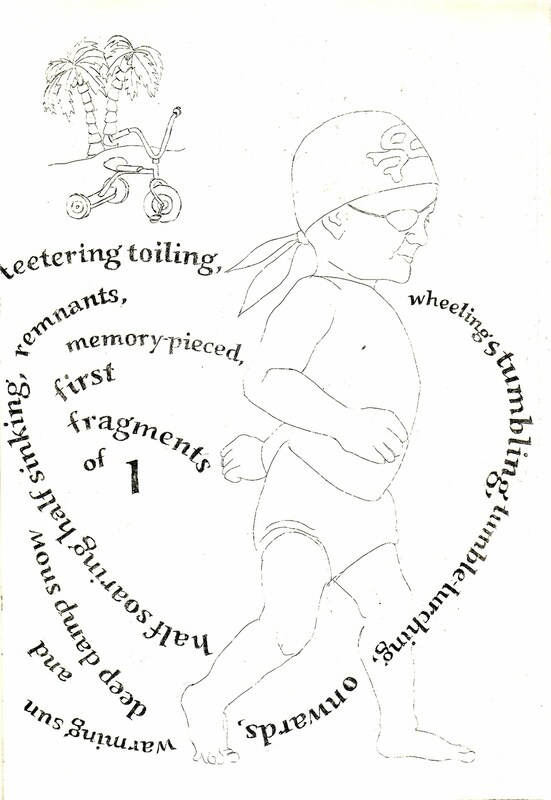 Born in 1903, it seems that Ravilious had a pleasant childhood and uneventful adult life (before it was tragically cut short in 1942 when he was just 39). I say uneventful; he married (and had affairs), had three children and a very successful career in design before being commissioned as a war artist at the outbreak of the second world war. I guess what I mean is that as far as I know, his life seemed relatively trauma-free. And by all accounts he was terminally cheery. 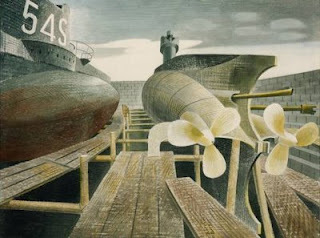 Fellow artist and friend Douglas Percy Bliss said, ‘I never saw him depressed. Even when he fell in love – and that was frequently – he was never submerged by disappointment. Cheerfulness kept creeping in.’ How tiring that must have been for everyone around him. Even in the throes of war, he seemed abnormally optimistic. About his post in the Observer Corps on Sudbury Hill, he wrote: ‘We wear lifeboatmen's outfits against the weather and tin hats for show. 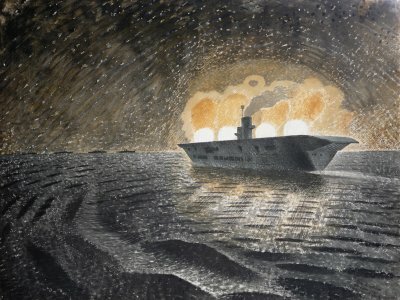 It is like a Boy's Own Paper story, what with spies and passwords and all manner of nonsense.’ And in the midst of bloody sea battle off the coast of Norway: ‘I enjoyed it a lot, even the bombing which is wonderful fireworks.’ Insane. This cheeriness filters through to his war paintings, which rather leave me cold. 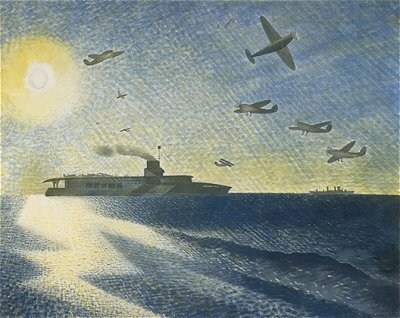 Whilst I don’t dispute that he was a talented artist, to me his watercolours feel like an extension of his design work and have nothing of the horrors of war about them; there’s no angst or real sense of drama. The pale colours and simple shapes might look more at home as fabric designs (I wouldn’t mind his cheery boats and planes bobbing across my curtains…). 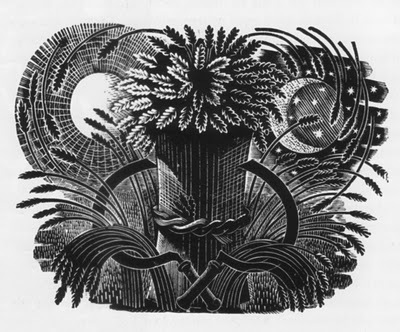 His wood engravings on the other hand, are a whole different ball game - much more effective. Think I'll stick with those. I’m reading a rather interesting book at the moment; The creative Dreamer by Veronica Tonay PhD. The subtitle is ‘using your dreams to unlock your creativity’, which sounds a bit cheesy – more cheesy than the book actually is. So far anyway. The first two thirds of the book are all about the psychology of dreaming, creative personality types and how the two fit together. There are some interesting statistics about the likelihood of creatives experiencing certain events and situations as a child and of the personality traits they may have as an adult. What I wanted to mention here though are the differences researchers have found between how men and women dream. Mostly, both genders dream in a similar way (as do people across cultures), but there a number of differences. Apparently, women dream equally of men and women whereas men dream more often of men. Women dream more often of people familiar to them whereas men dream of strangers more often. Research has shown than aggression is very common in dreams; women dream of themselves as the victims of another’s aggression more often; men have more aggression in their dreams and are more often the initiators than women. Women have roughly the same number of friendly and aggressive dream encounters, whereas mean have aggressive ones more often than friendly ones.